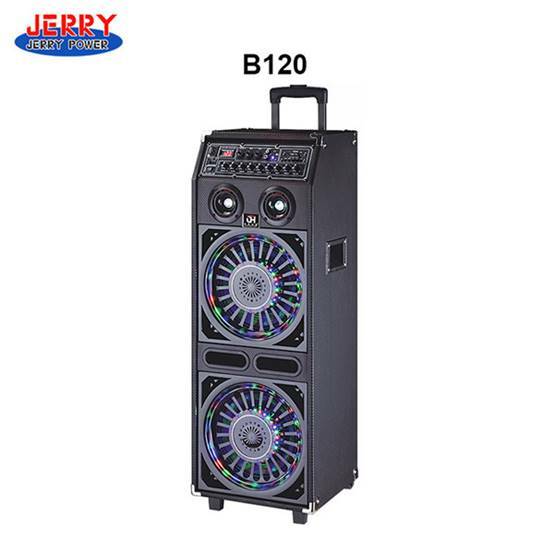 DJ Music Trolley Speaker has a built-in stereo Bluetooth speaker rechargeable battery. This product is equipped with handles and wheels for easy carrying. For business or leisure, the stereo sales sound system was built for sensational performance. Trolley speakers have built-in Bluetooth, microphone, and USB. This DJ Music Trolley Speaker has a two-way design. Its bass is thick and powerful, and the treble is clear and bright, so the sound is layered. It emits a delicate sound and spreads widely to meet the needs of thousands of people. It can be used indoors, outdoors, squares, stage, event promotion, dance rehearsal, etc. 1. The streamlined tie rod is strong and not easy to break, and is equipped with a pulley at the bottom to make it easy to transport. 2. The one-piece design can effectively reduce the collision during use and prevent the damage and damage of the speaker. 3. The external iron mesh cover is sturdy and durable, which can effectively protect the speaker unit. 4. Unique built-in Bluetooth wireless connection allows you to easily play music from a distance.